VibraDamp, our own specially designed vibration damping pad is a versatile product. 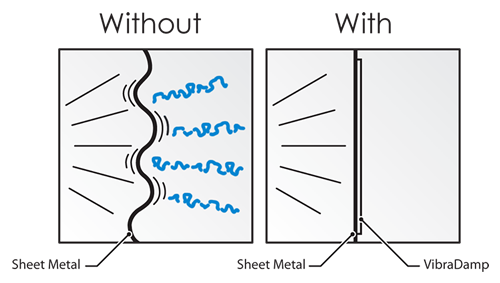 We have designed this product to dampen the vibrations transferring through any plastic or metal surface. It is most commonly used to wrap metal drain pipes and sheet metal ducts but can adhere to any smooth lightweight surface to reduce, and often eliminate, sound transfer through the material. Other applications include vehicle interiors, machinery, furnaces, and appliances. The black side of the VibraDamp isolation pad is a self stick butyl that will easily to attach to pipes, duct, and other clean smooth surfaces without additional fasteners. The opposite side is a reflective aluminum constrained layer with a finish consistent with sheet metal. Each sheet is sized at 19.5” x 29.5" covering a total of 4 square feet per piece. For drain pipe coverage, estimate 40 linear inches per sheet for 4 inch drain pipes and 60 linear inches for 3” drain pipes. Calculate the circumference of the drain pipe or round duct by multiplying the diameter by 3.14. Remove the release paper from the VibraDamp and press the black butyl side against the surface. Avoid air bubbles or large wrinkles in the material by pressing firmly from one end to the other. Cut the VibraDamp with a razor into strips to fit around elbows, corners, and other tight areas. VibraDamp is similar to mass loaded vinyl in weight, but with damping properties several times greater than both 1 LB and 2 LB MLV. While a single layer provides significant damping, a double layer of VibraDamp has been tested to show triple the damping. On a scale of 0 to 1, the damping rating of sheet metal is around .006. With VibraDamp installed against the sheet metal, the damping increases to .441. This is a gain of 7500%, similar to what Green Glue Compound accomplishes in a wall. Based on feedback from several customers, a single layer of VibraDamp around a drain pipe is at least equal to the performance of cast iron (almost nearly isolated from all resonance). A double layer of VibraDamp around a drain pipe will achieve full isolation.